I’m in the middle of working on a very large overambitious project for my blog birthday next week. So what do I do instead of work on it? Decide it’s time to seriously practice my crocheting of course. I had my friend Teresa come over yesterday and give me some pointers. I was hoping she could tell me why everything I try to crochet goes so astray. I figured a few things out but I’m still so sucky at it. 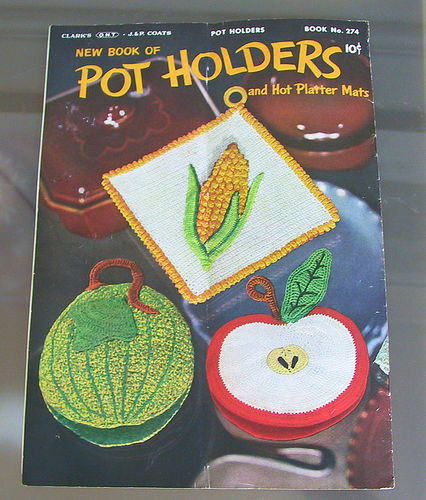 I tried to make this apple potholder from this vintage pattern I found. And, well, you can see how it turned out. Guess I need to buy the correct gauge yarn if I don’t want huge scary leaves. And my core is waaay off. But it is recognizable as an apple right? That’s something! UPDATE: actually now that I’m looking at it here online, the pattern and the potholder side by side, the leaf is about right. go figure. 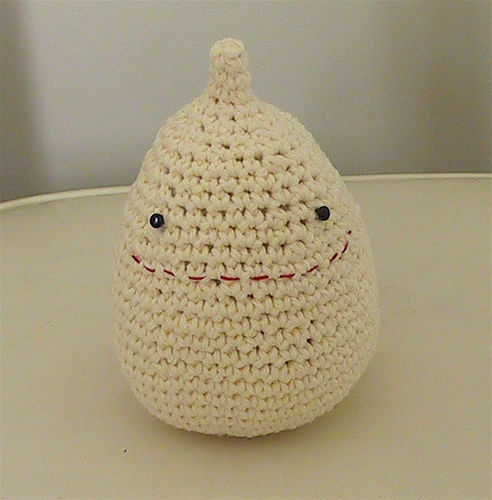 I was inpsired to try crochet again after getting this super cutie crocheted dollop of cream that I ordered from Cheryl in the mail last week. Thanks Cheryl for making such cute things! I love him so much. Oscar’s a big fan too. We actually took him to the park the other day. She also sent this very cute magnet which has cheered my fridge right up. Very cute Hillary! I wouldn’t call your crochet “sucky” at all! Just being able to follow a pattern is admirable. I love the dollop too, sweet! 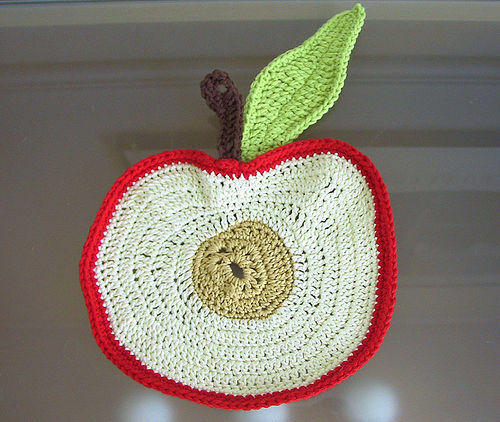 your apple is well crocheted! Oh I think your crochet looks great! Love that apple, and love the cream dollop you got too! I love the corn one. LOVE IT. I pretty much love anything with corn on the cob on it though. If I got a tatoo, I’d get corn on the cob. But not on my foot. ha! i don’t know now whether to respond to your post or michelle’s comment. that cracked me up. but i’ll stay focused: i love your potholder. you are nuts silly girl! everything you touch is charming. it is simply not fair of you to be throwing any kind of pity party, especially before your blog birthday. tsk! terrific crochet! i know what you mean about suprisingly large finished products–i have the same problem but your leaf looks great! that dollop of cream is too cute! yay for apples & cream!!!! Before the lovely apple loaded onto my screen, I expected to see one of the wonky, uneven gauge squares that I produce after much effort. I think your apple looks lovely. What a great booklet! Thanks so much for your nice words about little cream dollop. I’m so excited that you and Oscar like him, and that he gets to go to the park!! The apple’s adorable. I love the little seeds. 🙂 I just learned how to crochet when I went to my grandmother’s over the weekend, but obviously I haven’t learned much yet. It’s fun though! Your pot holder is too cute! If you want to see some pitiful crochet (for real) check out my chicken-hawk-eagle-robin that Amy posted on Angry Chickent june 9th. I thought I was doing it right but it took off with a mind of its own! the dollop is very sweet! I love the apple, too cute! very nice.it looks very apple-ish. And michelle’s comment is too funny! I too, am a lover of corn. I have only crocheted once-when sadie had a fever. I think that’s what it will take for me to ever pick-up a new craft again. I love the appple and as you haven’t said what its dimensions are, I’m left thinking it’s about 18″ across! But maybe even one that size could have its uses? Great work. Crochet is awesome. I pass up knitting everytime to crochet something. Bags, flowers, aprons whateva! Go, crochet! I just took 2 books out of the library to teach me how to knit and crochet. I did one long strand and thought I was pretty cool. I think the apple is great! I also vote for you to make the corn. you could have a whole sunday supper before you know it…even a crochet roast….that would be cute!! You’re right. Comparing your apple with the pattern picture, it’s perfect and looks as great as if you have crocheted all your life! I like the big ole leaf and it does look right according to the pic. Fabu! Girl I don’t know what you’re talking about, that apple is great! Maybe it’s not perfect, but I always judge by the ‘would I want to own it?’ rule. And you know what? I would! Definitely beats all the grubby old things I call potholders in my home! Keep at it, you are so talented, I’m sure your next one will be *perfecto* !!! I just wanted to let you know I posted my backtack package to you today. It has a long way to travel, and I am told this may take up to 10 days. So it may be a little later than it’s supposed to be, but I hope you will enjoy it all the same.